Telstra is implementing Infinera’s fourth-generation ICE4 optical engine across its Asia Pacific subsea infrastructure to increase capacity, agility and reliability. The ICE4 upgrade increases Telstra’s fibre capacity by 160 percent and port density by 140 percent, while also decreasing power consumption, allowing Telstra to continually improve network services for customers. Telstra is one of the largest providers of 100 Gbps network services globally and the ICE4 technology positions the company to support customers’ future connectivity demands, activating capacity per wavelength of up to 200 Gbps. 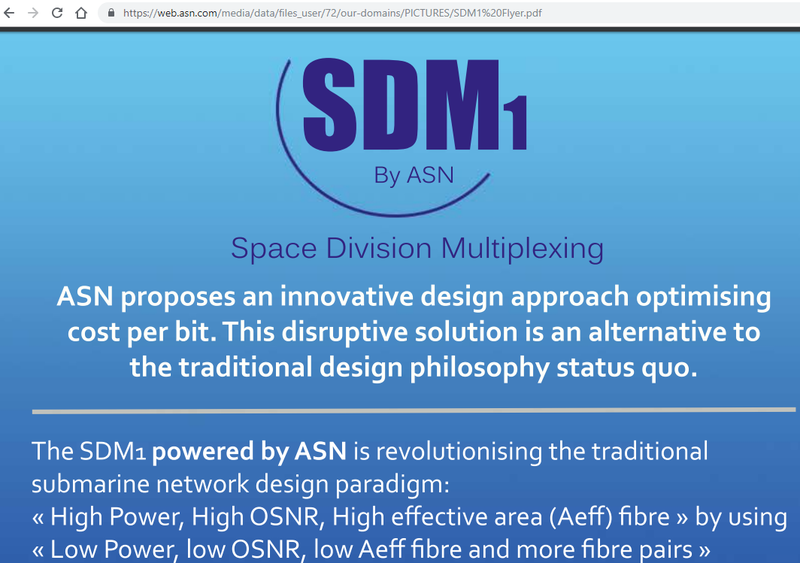 At this week's PTC'19 conference in Honolulu, Alcatel Submarine Networks (ASN) is introducing an “SDM1 by ASN” technique using Space Division Multiplexing for optimizing cost per bit on subsea cables. According to posted materials, ASN aims to push the limits of theoretical design capacity by minimizing the non-linear effects that add complexity and cost. 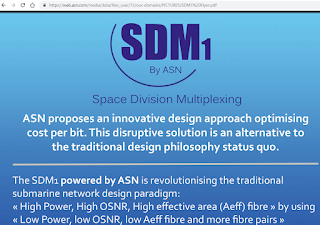 “SDM1 by ASN” will leverage a combination of repeater pump farming, low Aeff submarine fibres, and higher fibre count cables. 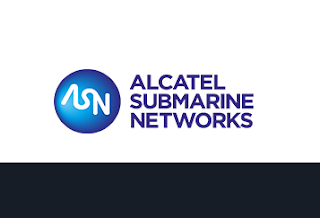 Alcatel Submarine Networks (ASN) announced the commercial availability of aluminium conductor cable for optical fiber submarine systems. ASN says aluminium offers an alternative to copper conductor cables, with same level of quality and reliability. The company has conducted extensive testing and qualification program to demonstrate its suitability for ultra-long haul deep sea transmission systems. This included mechanical, electrical, optical and environmental tests performed on deep sea and armoured cables, also validated during a sea trial. ASN also noted that this new cable variant has already been selected for a major long-distance project by Facebook. conductor, which is one of the most expensive raw materials currently used in repeatered submarine systems. A better cost-effectiveness, while maintaining a performance equal to copper. A more stable supply market, which benefited over the past fifteen years from technology improvements, mainly driven by the oil & gas industry. This has led to the development of new industrial techniques and equipment now available for aluminium processing and welding on long distances. A potential for higher speed of production to speed-up the delivery of new systems. An enabler to achieve solutions for low direct current resistance (DCR) with higher number of fiber pairs. Philippe Piron, President and CEO of Alcatel Submarine Networks said: “The introduction of a new cable variant using aluminium conductor addresses the market demand for more cable capacity at a reasonable cost, while keeping the same level of quality and reliability. After the introduction of loose tube technology in submarine cables 25 years ago, ASN is again the first to bring an innovative improvement to submarine cable design, and continues to show its leadership by anticipating customer demands." 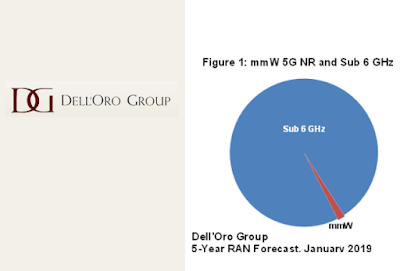 Robust demand for 5G NR will propel the cumulative worldwide RAN market to approach $160 B over the next five years, according to a new forecast report from Dell'Oro Group. New capex to address IoT, Fixed Wireless Access, In-Building, and Public Safety opportunities for both private and public deployments will comprise a double-digit share of the RAN market by the outer part of the forecast period. Sub 6 GHz Massive MIMO transceiver shipments are projected to eclipse 200 million. 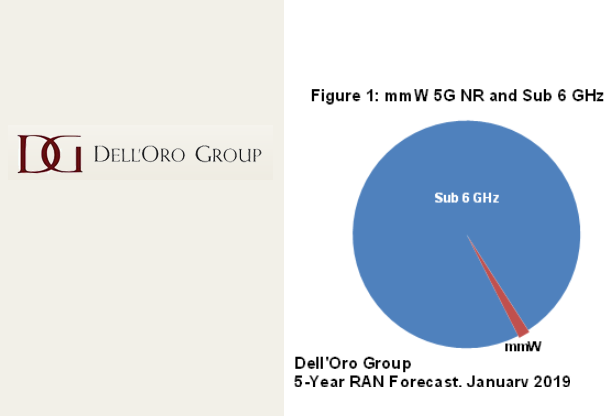 “Even if 5G will be just another G initially, the reality is that for the carriers with the right spectrum assets, the mid-band Massive MIMO business case can be extremely compelling for the MBB use case,” said Stefan Pongratz, analyst with the Dell’Oro Group. “At the same time, we are more optimistic today about the mmW opportunity than we were a year ago. But clearly it will take some with the current inter-site distances before the cost per GB economics will be as favorable with the mmW spectrum as the mid-band sub 6 GHz spectrum using the existing macro grid and Massive MIMO,” continued Pongratz. Oracle inaugurated a Toronto data center to support in-region customer demand for its public Oracle Cloud Infrastructure service. Oracle plans to open additional regions in Australia, Europe, Japan, South Korea, India, Brazil, the Middle East, and the United States, including Virginia, Arizona, and Illinois to support public sector and Department of Defense customers. This expansion complements an existing Edge network consisting of more than 30 global locations and 300 plus sensors, providing Oracle customers with a comprehensive Internet performance data set, and deep edge services capabilities. 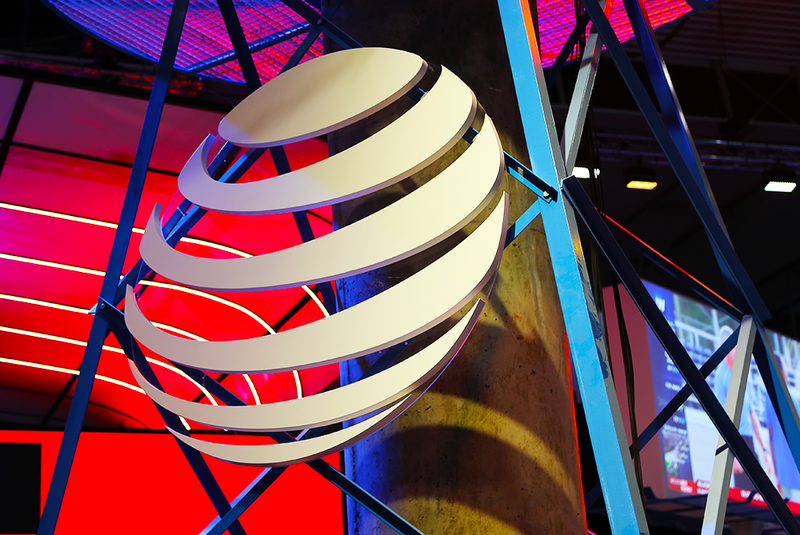 "The 5G services we’re rolling out and combining with our advanced network capabilities will help businesses fundamentally change for the better,” said Mo Katibeh, CMO, AT&T Business. “It will open up opportunities to increase revenue, reduce operational costs, and ultimately create amazing new experiences for employees and customers. Whether it’s a local startup, a growing regional company, or national enterprise, these 3 pillars are going to be groundbreaking." Jaguar Network, which is based in Paris, operates data centers in Marseille and Lyon, along with a private fiber network extending 7,000km across France and neighboring countries. 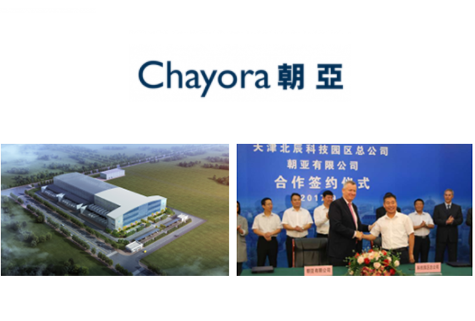 Chayora, Hong Kong-based data centre infrastructure company, entered into a strategic partnership with Beijing Sinnet Technology to deliver bespoke network solutions and cloud services solutions for Chayora customers. In addition, Sinnet also plans to use the Chayora 300 MW hyperscale campus as a location for its retail colocation expansion in Beichen, northern Tianjin supporting the wider Beijing region. T-Mobile US named Ulf Ewaldsson as its new Senior Vice President, Technology Transformation, reporting directly to Chief Technology Officer and EVP, Neville Ray. Ewaldsson spent nearly 30 years at Ericsson, where he most recently served as a senior advisor to the company’s CEO. 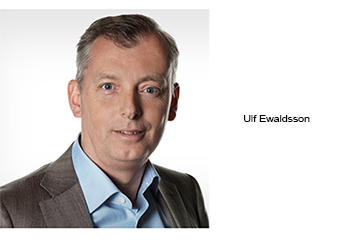 Prior to that, Ewaldsson held various senior leadership roles including Senior Vice President and Head of Business Area Digital Services, Senior Vice President and Chief Strategy & Technology Officer, Head of Group Function Strategy & Technology, and Head of Product Area Radio. Toshiba Electronic Devices & Storage expanded its lineup of automotive Ethernet bridge portfolio with new “TC9562 series” ICs. Sample shipments will start in February, and volume production will start in October.